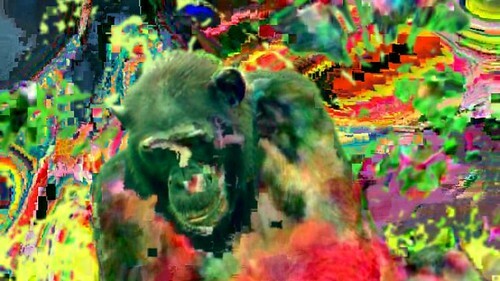 The Futurist-like newspeak that is often used to describe new media and web-based artworks is amusing, but limited. Technology is a tool, not necessarily a portal to another universe. Text messages, social networking web sites like Facebook and MySpace, weblogs, and a revolving door of tech-dujour applications promise to make our day to day lives easier and more efficient. Accessing information is no longer an overwhelming task — but a seductive, instantaneous experience. PREDRIVE: After Technology features new works by six international artists including Takeshi Murata, Brody Condon, Paperrad, Gretchen Skogerson, and Antoine Catala that interrogate the “aesthetics of immediacy” produced by these technologies in contemporary art. The exhibition, guest-curated by Melissa Ragona, explores themes of digital effects and dysfunctions, readymade cyber-kitsch, software aesthetics, and the performativity of digital environments in real space. 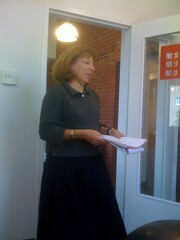 Melissa Ragona’s critical and creative work focuses on sound design, film theory, and new media practice and reception. Her current book project, Readymade Sound: Andy Warhol’s Recording Aesthetics, examines Warhol’s tape recording projects from the mid-sixties through the late-seventies in light of audio experiments in modern art and current practices in media technologies. Her essays in film and sound criticism have been published in the MIT Press Journal, October; Duke University, Illinois and Ashgate presses. 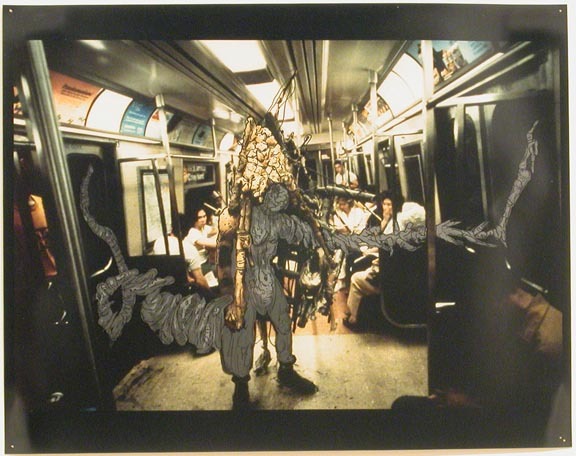 Ragona’s catalogue essays on contemporary artists have included Heike Mutter, Ulrich Genth, and Christian Jankowski. 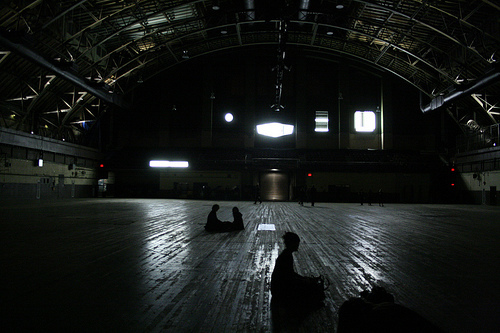 Ragona has curated film and video exhibitions and festivals for national and international venues, including a production of Miranda July’s Swan Tool, as well as the films and videos of experimental filmmakers Peggy Ahwesh, Pat O’Neill, Yvonne Rainer, and Benton Bainbridge. She currently teaches in the School of Art at Carnegie Mellon University. Have you seen INNER AND OUTER SPACE? Do you agree or disagree with this review? Post your opinion in the comments or send us a link to your review and we'll post it here. Today's additions to the auction catalog are below. Click the image to view details. New lots are rolling in each day, so stay tuned for frequent updates. How do they relate to this post? More information about the Art Auction can be found HERE. 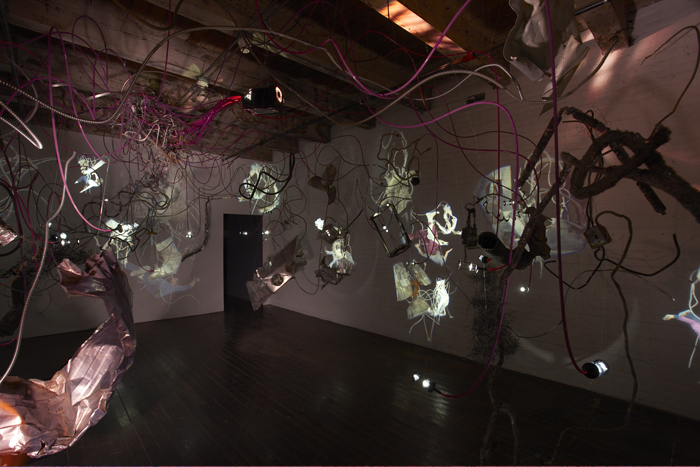 Across town from the galactic-themed Carnegie International exhibit Life on Mars, the Mattress Factory brings together nine artists who explore art and space in Inner and Outer Space. Modern art's spatial investigations are reprised in Luca Buvoli's sculptural Instant Before Incident (Marinetti's Drive 1908), representing futurist pioneer F.T. Marinetti's fateful car crash; recalling a three-dimensional futurist painting, the piece literally leaps out of the gallery through a window. Bahamas-born Tavares Strachan collaborated with scientists from Carnegie Mellon to develop a robotic rover that explores a fictional stellar landscape in Where Do We Go from Here and reports back to a command center in the museum parking lot. The museum space is further transformed by Mary Temple's pair of trompe l'oeil installation paintings of shadows, while Sarah Oppenheimer provides an unusual vantage point with her hole in the floor. Desire for a dialogue with the history of Pittsburgh, the architecture of the Mattress Factory’s main building, and the James Turrell and Yayoi Kusama installations on permanent view prompted New York–based curator Dara Meyers-Kingsley to bring together nine artists under the titular theme. 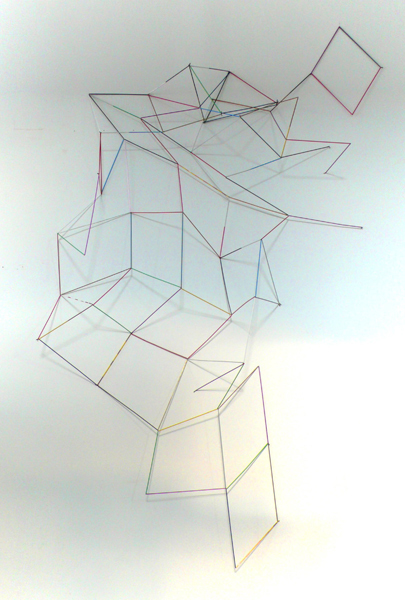 Spatial and psychological issues mark much of today’s art, yet this show constitutes a fresh approach to the subject, as the selected works address their environment in an intellectually and sensorially challenging manner. 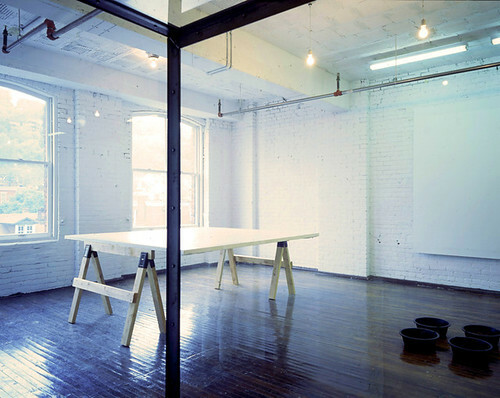 Sarah Oppenheimer’s 610-3356 (all works 2008) consists of an aperture that intersects both the floor and the window of two small rooms on different stories of the edifice, allowing new views into the street. 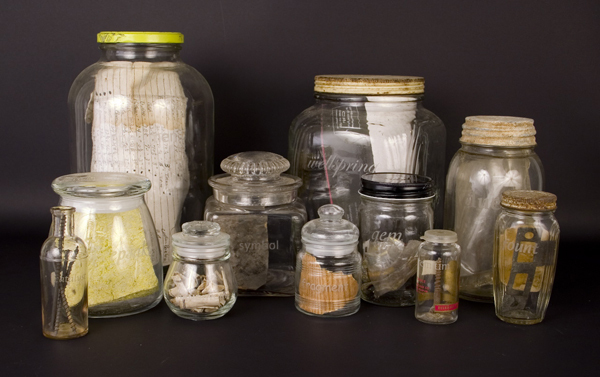 The work’s title references a system the artist devised to classify the materials used in her works. 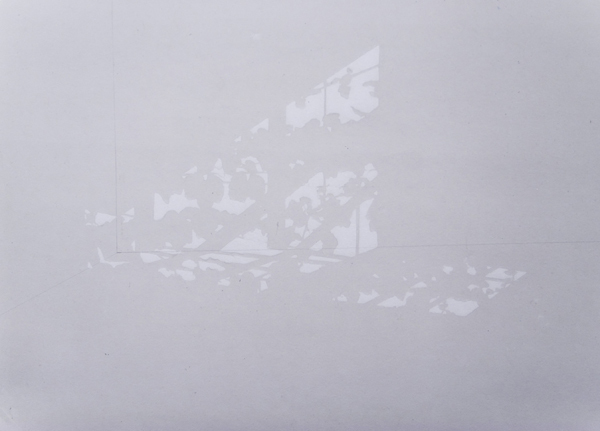 Optical questions also define Mary Temple’s Transparent Brick Wall for Kusama: a wall painting, done in the artist’s signature style, that features a subtle silhouette of a tree, as if its shadow were cast through a nearby window. 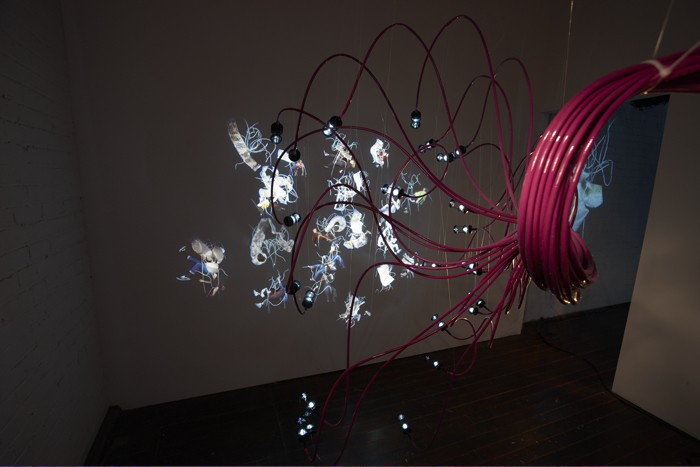 Daniel Canogar’s Midnight Plumber I and Midnight Plumber II add bodily forms to the trompe l’oeil effect: In two adjacent, darkened rooms, Canogar presents a complex net of fiber-optic cables and projected slides of different humanlike figures in a state of suspended animation. 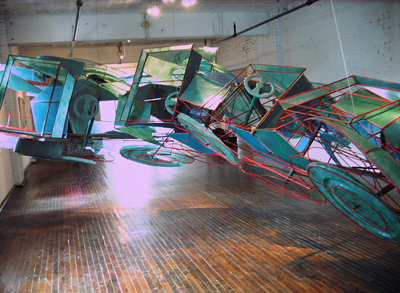 In Instant Before Incident (Marinetti’s Drive 1908), Luca Buvoli references the famous car crash caused by Futurism founder Filippo Marinetti by stringing, from floor to ceiling and through a window, a long chain of replicas of the early-twentieth-century Fiat driven by the Italian poet. By intertwining traditions of culture and economy in Italy and the US, Buvoli explores the heroic mythologies of national identity. Sensitively mixing physical and mental interpretations of the exhibition’s organizing principle, the nine artists push the boundaries of established notions such as space and perception, breaking ground for new trends in the relationship between art and the built world. 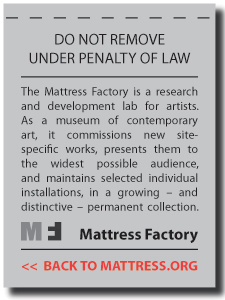 With Damien Hirst's Beautiful Inside My Head Forever auction at Sotheby's making international waves lately [ 1 - 2 - 3 ], it might be prudent to mention here that the Mattress Factory was the first museum to show Hirst's work in the United States. A 50-foot corridor of glass and steel separates the viewing public from the gallery. 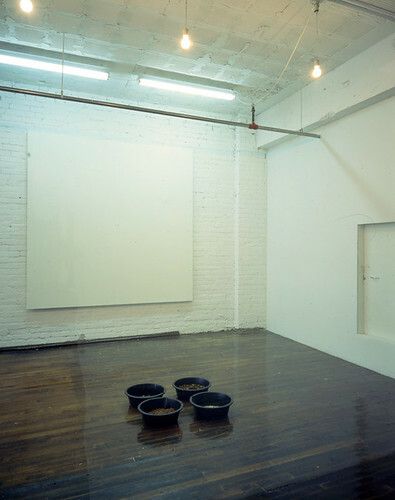 There are four white monochrome paintings, 7' x 7', in each of two galleries. Three, hanging on the walls, are sprayed with sugar water. One, propped horizontally on sawhorses, is sprayed with a clear adhesive that never dries. In front of each painting are four black bowls. One bowl contains powdered sugar and powdered milk; another, covered with gauze, contains water. Two contain a mixture of molasses, wheat germ, yeast, and water, where flies would lay their eggs. Initially maggots were placed in the medium, to begin the natural process. As the maggots become flies, they drink the water and eat the food, which is changed regularly. The installation opened with a pristine cleanliness. 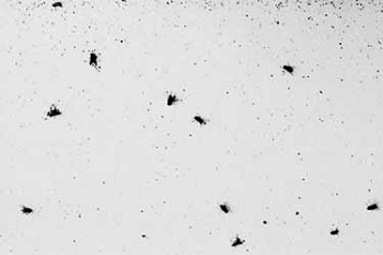 As time passed, the flies multiplied, and the space and the canvases became dirtier and dirtier. This video was filmed live on the street in front of the Mattress Factory's Annex Gallery during the opening reception for Illustrations of Catastrophe and Remote Times (January 18, 2008). Have a great weekend. And don't forget, City of Asylum/Pittsburgh's JAZZ/POETRY CONCERT is Saturday night. See you there. 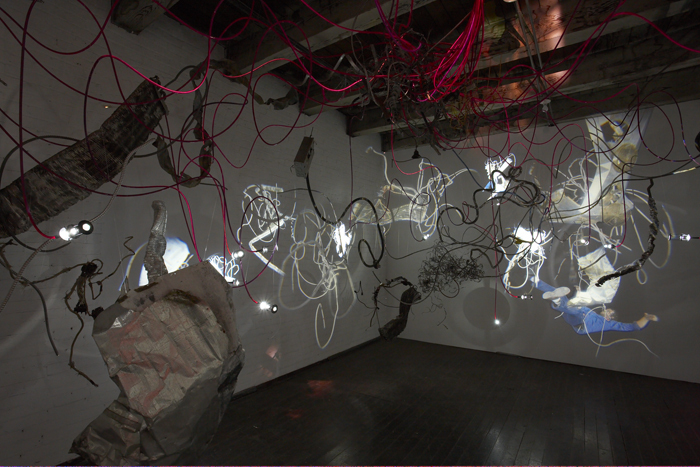 Working with fiber optic cable, photographs and projectors formed into spider-like sculptures that suspend from the gallery ceiling, Daniel Canogar projects slides onto the dark gallery walls. 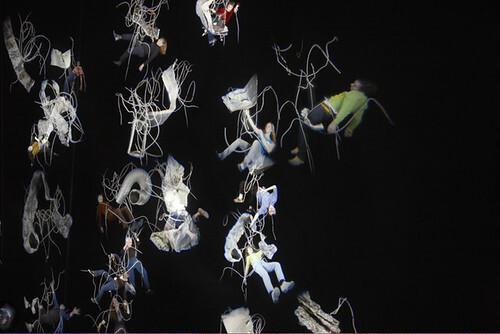 Fascinated by zero gravity and the experience of weightlessness, Canogar found the fiber optic medium to be perfect for projecting photographic slides of figures and forms that seem to float in a three-dimensional universe while on a two-dimensional wall. Canogar’s work explores our contemporary journey in search of weightlessness and how our compulsive distancing from Earth has changed us forever. For these installations, he scoured local recycling centers around Pittsburgh to find metallic scrap for the installation. 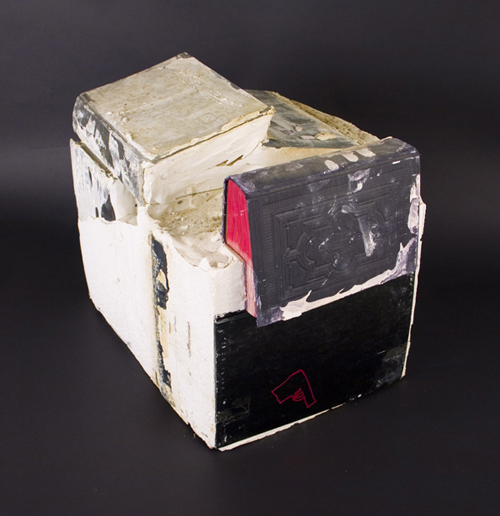 Canogar was drawn to the sculptural quality of the waste and also for its particular significance to Pittsburgh—a monument to the city’s great industrial past. Canogar’s work reminds us of our place in the larger universe, and our responsibility to the planet. The works mean to connect literally and figuratively—engaging these connections through the photographic process. He invited Mattress Factory staff members, their families and friends, and an even larger network of participants—local dancers and acrobats—to be models in a photo shoot, hanging from harnesses. 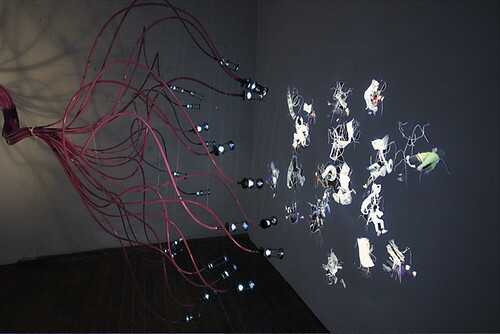 In the first installation, the single fiber optic projector sits high in the small space, with cables cascading down, tethered and then projecting on the wall—24 images of figures from 24 tentacles. The figures look weightless wrapped in scrap metal. The whole ensemble of images seems as if pulled together by some strange gravitational force. It is a cluster of bodies and junk pulled together. 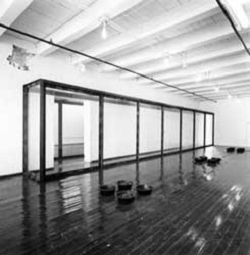 In the second installation, the work has exploded. The fiber optic cables snake through the floating scrap metal so that projections cast on the wall hit people’s bodies when walking through space. The gravitational pull in the first installation has let loose, and now there is a sense of an expansion of all of this—creating a virtual expansion of the actual room.